Do you eat while watching TV? Or in front of your computer? Or while working? 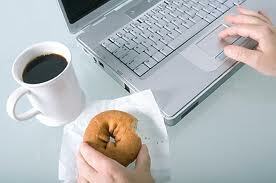 Recent research has indicated that distracted eatin g can lead to increased calorie consumption. Several of these studies compared two groups of eaters – those who ate in front of the TV and those who didn’t. The basic findings were that those who ate while watching TV tended to consume more calories at that meal; and those who paid attention to their meal tended to consume fewer calories at a later meal. There is a mind body connection when it comes to eating. Your awareness of the food you’re consuming is one of the cues your body uses to decide how soon to be hungry again. If you are oblivious to what you’re eating, it is not only easier to over-consume at that meal, you also tend to get hungry again sooner because you don’t recall having eaten. The opposite of distracted eating is to be mindful or attentive to what you are eating. Unplug the computer, TV, etc. and eat at the table. Take time to set the table with silverware and plates, maybe even candles! Eat at a slower pace. In fact, you can try to eat a normal-sized meal taking at least 20 minutes, since that is the time it takes for your brain to get the message that your stomach is full. Eat with your non-dominant hand. Take a sip of water between each bite. Notice the color, smell, texture, temperature and taste of your food. Take small bites and savor them. Put away cell phones and other electronic devices. Have pleasant conversations with family, friends or co-workers during your meal. The benefits of attentive eating are not only consuming fewer calories, but also increasing the likelihood that you’ll eat healthier food and enjoy it more! Writer: Shannon Carter, Extension Educator, Family & Consumer Sciences, Ohio State University Extension, Fairfield County.